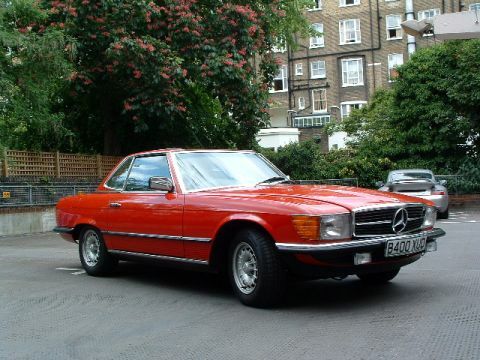 MERCEDES BENZ 280 SL 2 DOOR AUTOMATIC CONVERTIBLE , 1985 B, 39000 MILES, SERVICE HISTORY, RED. This must be one of the best examples available of this useable classic sports car. This car was stored for some years leading to the exceptionally low mileage, and spent some of its life based at Kensington Palace. The paintwork is bright red with rare dark blue leather seats. Removable hardtop Automatic transmission Power steering Full leather interior Radio Cassette Alloy wheels Anti-lock brakes Front electric windows Central locking Cruise control Internally adjustable door mirrors Front fog lights Headlamp wash Tinted glass .